Roya Mehdizadeh-Valoujerdy is keen to advance her coaching skills. Although still only 17, Roya Mehdizadeh-Valoujerdy has already built up a bank of volunteering and coaching experience, having started at school as a young leader. The Derby College student, from Belper, is completing A-Levels in Psychology, English Language and Government and Politics at the Joseph Wright Centre, while also pursuing her interest in sports coaching. 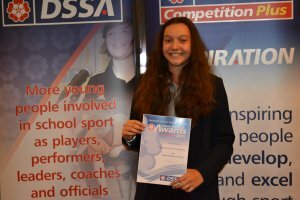 "I first got involved with volunteering at school when I achieved my Junior Sports Leadership Award Level 1. 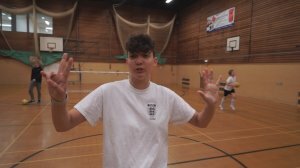 "This was a great experience and inspired me to become a young leader, so from this I became a Gold leader with Amber Valley School Sports Partnership and began volunteering with everything and anything! I set up an ultimate frisbee club for Year 7s at my school with three other leaders and successfully ran it during my last year at school." Roya was highly commended at the 2015 DSSA Awards. "Last year (2015), I was nominated for a DSSA Award (Secondary School Young Leader of the Year) where I was highly commended. "It was extremely rewarding and to be recognised for my volunteer work in Derbyshire and was also really exciting. It massively motivated me to continue volunteering, further my opportunities and better myself as a leader to help coach and better others. "The very first coaching I did was in taekwondo, helping my instructor teach the younger, lower grade class. This was about five years ago, and I instantly loved coaching students to better their skills and help them pass their grading and get to the next belt! "This was what really started my love for coaching and encouraged me to further my coaching into different sports. I recently achieved my Assistant Instructor Course Part 1, and I am hoping to complete part 2 and become a fully qualified instructor. Roya now coaches on Saturday mornings. "I now coach two football sessions on a Saturday morning, the first session is a disability session and the second is a Soccer Stars Programme for four to seven-year-olds who are first getting into football. "I have also recently started coaching at Belper Sports with the U10s girls team last season, which was great, and I'm hoping to continue with them. "I still continue to teach taewwondo as often as I can, mainly on Wednesdays, assisting for three hours with lower grades and black belts, before having my own session and assistant teaching the adult class. "Sport has always been a huge part of my life! Throughout school I played all different sports including football, but mainly played netball at Ripley Netball club and then played basketball at Derby Trailblazers. "However, my first sport has always been taekwondo, where I have competed at the British Championships and achieve a bronze medal and I recently competed at the World Championships, which was an incredible opportunity! "Coaching has become a whole new part of my life. I was lucky enough to be selected to attend the FA's Football Futures Academy a few weeks ago where, as leaders, we were tested to think about our Leadership Philosophy and how we coach. "Coaching has also taught me how to be creative, think on my feet, and how to develop relationships with people, as, if you don't get on with someone, you aren't going to have much luck coaching them! "With this also comes building relationships with parents and others surrounding the people your coaching and I've massively developed these skills so that I can try and have the best possible relationship with everyone I meet. "I want everyone to get the most out of a session, as no two people are the same, so knowing your players is really important. "Without a doubt, the best thing about being a coach is enabling someone you coach to achieve something they want to achieve, however small or big that goal might be. "Sometimes that goal might not even relate to sport – but being able to help someone better themselves and feel good about it is easily the best thing about coaching for me. "I really think that if I can help make some smile, or help them achieve their life dream, then both are equally a success! Roya progressed to coaching through her volunteering. "Volunteers are SO important in the grassroots game – without them it doesn't work! "I'm lucky enough to have a job coaching on Saturday mornings, but I still volunteer with Belper Sports, because I love coaching so much and want to help the game grow. "All leaders are extremely valuable to sport and its players, they should never feel undervalued, as they are really what make sport work. 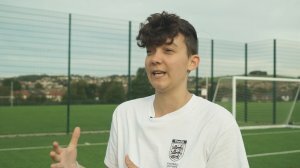 "For me, the next steps are going to be setting up new programmes to grow the girls side of football, and it's something I'm super-excited about so keep an eye out for that! "I'm also looking to get my level 2 in coaching football done to move up the coaching ladder, as well as looking to complete my taekwondo instructor course, so there's lots to do and exciting times ahead." Inspired to coach or volunteer? To find out more about how you can get into coaching, you can peruse our course finder and there's also the option to apply for a Coaching Derbyshire bursary.